Okay, this may not look like "art" (laughs). It didn't actually come up like what I have in mind, but I just got too lazy to start over again...so pinanindigan ko na! LOL. Turned out, some people liked it. And well, I like it too. 3. Dip the ends of a fan brush on a purple shade, and then sweep on the nail starting from the right side going to the left (or from Left to Right) then vice-versa. Last weekend, I was so happy because my nails got featured in Manila Bulletin! The feature was made by Jane Kingsu-Cheng, and it was about nail art. 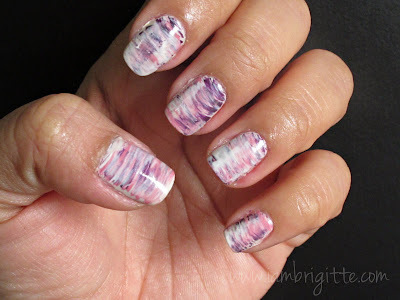 I was featured together with Nikki who happened to be my inspiration in trying out nail art. I may not be as good as her or the others, but I am just so happy that people appreciate my work. I promise to practice more, as practice really makes everything perfect. Thanks again, Jane! 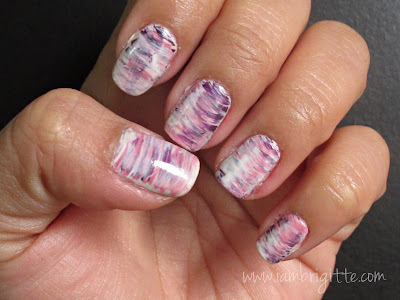 I got so kilig after seeing my nails on paper!